This image depicts the SystemStar Window with the File Menu pulled down. In addition to the standard File Menu commands, note the Open Model command. This command lets you load your own calibrated version of COCOMO or COSYSMO (created via the Calico tool included with the purchase of SystemStar). Your calibrated model would reflect your software development environment -- with equations tuned to match your history. The File Menu also contains the Copy Estimate command. You'd use Copy Estimate to make an exact copy of the current estimate (including a copy of every subcomponent) with a new name. Then, you can modify the new estimate to reflect different assumptions (e.g. you might model your project assuming you had a better tool set), and compare the two estimates. 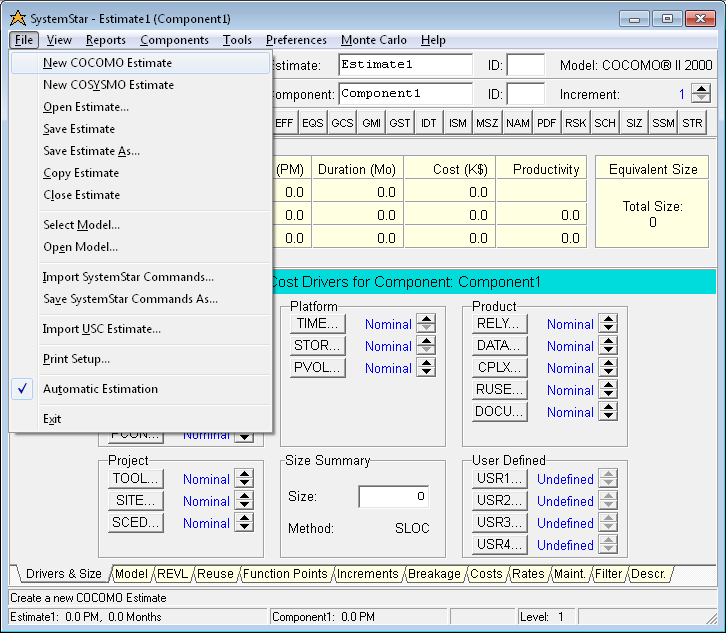 SystemStar lets you develop any number of estimates in parallel.